I don't think I live on Tatooine, so why do I have two sun curves? It's also going into the yellow in the middle of the day. @Bersaelor Let's start with, are you in New York or in Berlin? I notice that your coordinates do not match your city name. So, atm I am in New York and i tried updating the location a few times.. then I tried updating the city and press enter and it still looked like this. 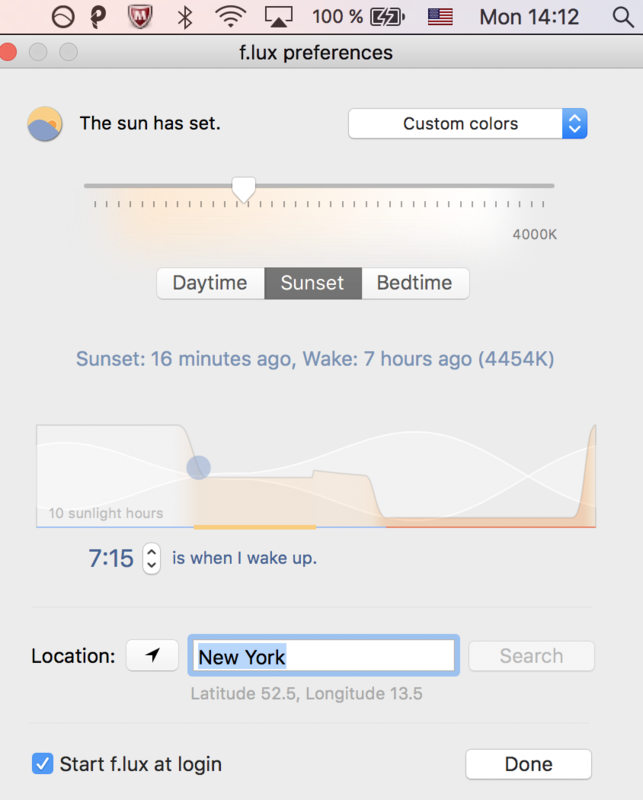 @Bersaelor Interesting -- looks like f.lux thinks you are still in Germany. Did you relocate with your router or wireless modem or something like that? Does typing in 40.7, 74.0 and hitting "Search" help? I hit 'enter' on New York one more time and now the location view popped up and I was able to confirm that I am in New York. So now the screen lightning is correct, but I still have a double-curve (I mean thats just an app visual thing, when one looks at the flux representation of daylight).